Remember when I talked about moving into our new house & getting to design my wardrobe room (here)? Well, it has proved to be more time consuming & lengthy of a process than we originally anticipated. So, while the entire room isn’t finished yet, we are making progress and I wanted to share with you the ways I have begun to organize my accessories in this new space. I'm getting a bench for this exact reason! !… Thanks for the inspiration! 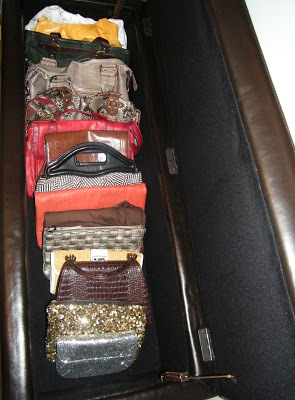 I love the way you stored your belts and necklaces ! Such a great idea ! 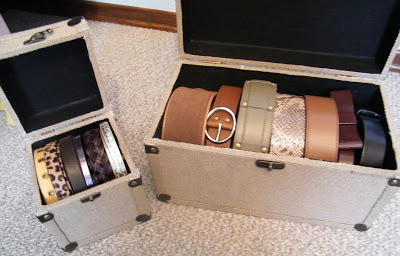 Love those burlap boxes and great way to store belts too! Mine are currently in a shoe box — a Missoni for Target shoe box — but a shoe box nonetheless. 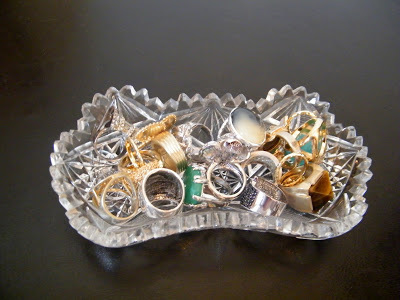 I love the crystal dish you placed your ring collection in, so classy! I desparately need to organzie my accessories… they are hiding behind clothes in my closet and it makes it hard to remember to put them on in the morning when I'm getting ready. I hate when I walk out the door with just earrings or just a necklace on. Do you have suggestions on how to organize hats and scarves? Those are overwhelming my closet right now! 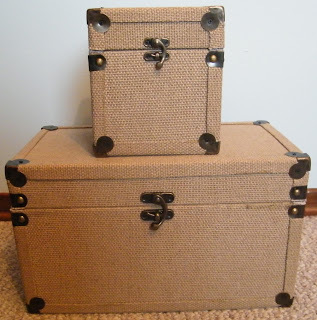 I love those burlap boxes. Where did you get them? Love the crystal dish -so nice when there is special meaning behind it as well. Like the necklace idea too! Okay these are great ideas! I love the hook for the necklaces. I am currently using tie holders in our closet but may look into something like that for the new house and I love the boxes for the belts and the leather bench is perfect for your handbags and clutches! I am just rambling because I love everything! I love how you hung your necklaces, decorative and keeps them being tangled. And using the leather bench is great, I had one and I never used it for anything useful. PS: Silk scarf giveaway on my blog, please pass by to enter. so, so creative!! Love that hook for your necklaces. I have something similar but now have added too many necklaces. 🙂 big problem, I know. Gosh I am so envious – can you please come to NYC and help me organise my bedroom closet? My belts are never in a good order!! 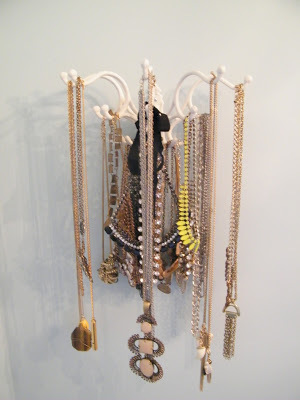 I love the hanger for your necklaces, and it idea of hidden storage makes me wonder what I could get to help me sort my own accessories. This is brilliant. I love the belt and bag ideas! Where did you get the necklace rack? I love it! !